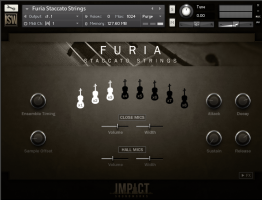 Impact Soundworks has released Furia Staccato Strings, an orchestral ensemble instrument for Kontakt focusing on unison staccatos performed in a true orchestral hall. Furia is intended to deliver a realistic ensemble sound with minimal effort. 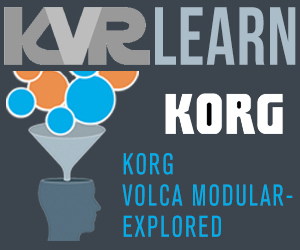 The library is optimized for ease-of-use and requires less than 150 megabytes of RAM without compromising depth of sampling as each note was recorded up to 16 times across two mic positions. 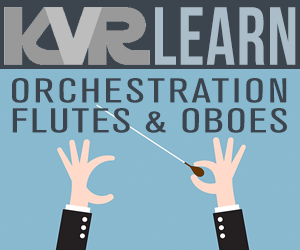 Other notable features include an ensemble multiplier magnifying the number of voices by up to 8x (for over 170 virtual players), one-click ensemble timing and sample offset, envelope controls, mic mixing, and a full FX rack with custom impulse responses. Price: $39. Impact Soundworks is also offering the instrument for free with the purchase of any other ISW products totaling $59 or more. 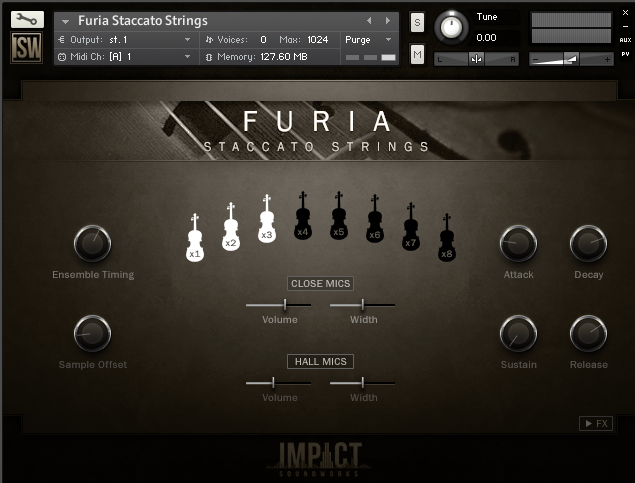 Customers can add Furia to their cart along with $59+ of other products, then use coupon code "FREEFURIA" to get this string instrument for free.